Núria Alabern is studying English at Mind the Gap. Aileen, her teacher, asked her to write a review on a film of her choice. Núria has written a very interesting review on “Testament of Youth”. She also incorporates a high level of language in her writing. So, take a look at Núria’s review. It might tempt you to watch the film! 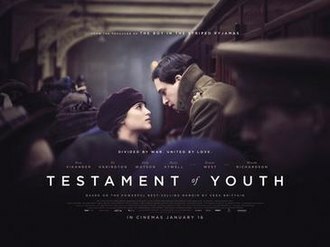 “Testament of Youth” is a historical-drama film based on the book with the same name written by Vera Brittain in 1933. With this work, Brittain exposed her memoirs during the devastating Great War and her experiences. Inside the film, Brittain is delightfully played by the captivating actress Alicia Vikander, who plays the role of Vera as a young girl from a conservative family who wanted her to get married as soon as possible. In contrast, she dreams of being a writer, and fights to get a place in Oxford. During her fight for pursuing her achievement, she receives the support from Edward, her brother, Victor, a close friend and from Roland Leighton, with whom she starts a shy romance. Roland is played by the charismatic actor Kit Harington. At the same time, the First World War begins in Britain and everybody’s life seems to suffer unexpected changes: Victor, Edward and Roland are enlisted. As a result, Vera needs to be close to them and decides to work as a nurse in the field and to give up her dream of studying in Oxford. In the middle of death and tragedy, Vera stays strong and helps as many lives as possible, concretely, in a German military camp. Thanks to that, she realizes that the Germans’ pain, blood and grief is the same as English people, and that war, is an endless circle of revenge. Finally, I totally recommend the book and the film. I think that it is a fantastic adaptation of the book because it shares the real essence of it and makes you think about the real meaning sense of life.